This three-hander is a play about the actor Peter Finch’s 12-year relationship with Jamaican Eletha Barrett, and the dynamics that bound them together. London-born Finch was – in 1964 – a renowned Hollywood actor; famous as much for his drinking and ‘hell-raising’ as for his film career and ‘movie star good looks’. 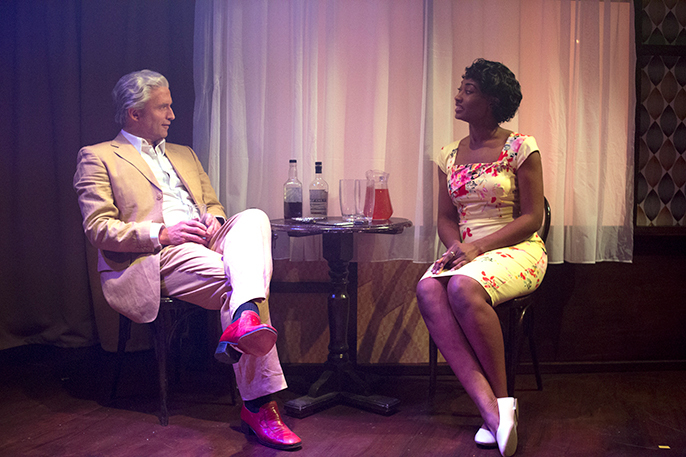 The play starts with Finch (Stephen Hogan) meeting Eletha (Vanessa Donovan) in a Jamaican bar where rich, Caucasian male customers can pay to dance with pretty local girls. An intoxicated Finch clearly enjoys engaging with the smart but world-blind Eletha, while she, in turn, makes it clear to him that her independent spirit and ‘Christian values’ preclude her from being easy pickings. Both of them appear to be attempting escape; Finch, from his rage and world-weary disappointment; Eletha, from poverty, class-perception, and Jamaica. 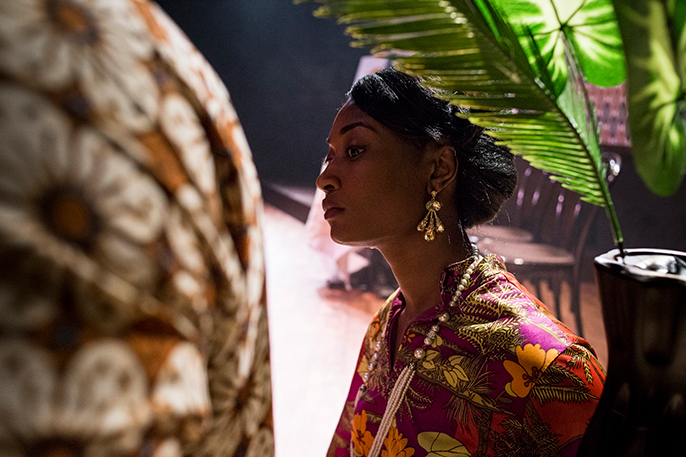 After a six-month sojourn back in London – dramatised by a scene with failing London actress / ‘bit –on-the-side’ Debbie (Alexandra Mardell) – Finch decides to go back to Jamaica to be with Eletha. Thereafter, they are inseparable; up to his death from a heart attack in 1976. The story is an intriguing one, but the choices made here raise more questions than they answer. Bearing in mind the fictional aspect of the dialogue / monologues, and the intimate one-to-one nature of the central dynamic, the play must go down as a wasted opportunity to fully explore the story’s many intriguing elements (e.g. ageism, classism, racism, economic disparity, mixed-heritage relationships, etc.). The production certainly references many of these issues, but often seems content to leave them at the doorstep, perhaps expecting them to fend for themselves. I would have liked to have seen this interesting story ‘go a little deeper’. Finch’s six-month tryst with Debbie is given more credence here than his two failed marriages. It is clear that the writers wished us to see a floundering, drowning man searching for a life raft (which he finds in Eletha). That’s all-well-and-good but, while the seas of adversity run deep here, one gets the feeling that we barely see them dipping their toes. There are tantalizing glimpses into both his and her inner worlds. His keen interest in radio broadcasts on Martin Luther King’s demise, and of the ‘rising immigrant problem’ in England, hint at his social leanings but - without hearing his considered thoughts - we can’t be sure [as history continues to show us, one can never take anything for granted when it comes to Class, Race, or Money]. And no, having Finch state that Paddy Chayefsky’s seminal speech (“I’m mad as hell, and I’m not going to take it any more”) could have been written ‘just for him’, should not stop the writers from attempting to create dialogue just as insightful. Here, it feels like a short-cut. Her dismissiveness of Bob Marley and ‘those ‘dirty Rastafarians’ hint at the Empire-imposed class division of a Jamaica she seeks to flee. When she does so, her willingness to look down on the maid Daisy (Alexandra Mardell again) – despite Finch’s observation of this apparent hypocrisy – are somewhat glossed over. In an interesting dialogue between them, they both admit to being “bastards” (i.e. children born out of wedlock), and discuss how this has made them the people they are. It is easy, in this more modern age, to forget that it wasn’t so long ago that to be called the ‘B-word’ was just as debilitating as being called the ‘N-word’. In a rare glimpse into the couple’s inner world, they swear that any children they might have will not be subject to this particular abuse. And how did they feel about what other vilification she might have to deal with (from all sides)? A little more insight – and / or dramatic license – would have been welcome here. 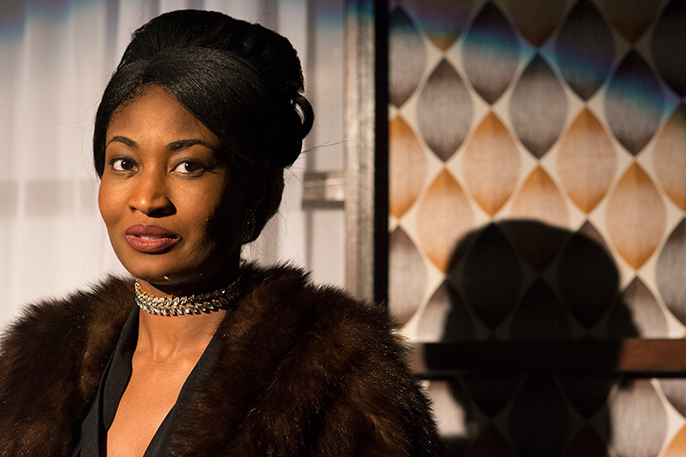 Vanessa Donovan’s Eletha seems a little unsure, especially in the early scenes. 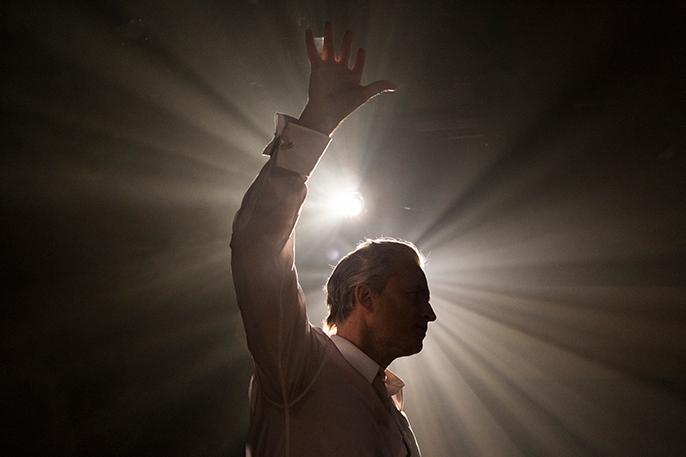 The character becomes a little clearer as the play – and her fortunes – progress. However, having just been introduced to her, I feel that I still don’t quite know who she is. Stephen Hogan is good as Finch; if not quite nailing the wild-eyed danger and charming charisma of the actor, he certainly comes close at times. The set is simple and effective, as are the props. Overall, I would have liked to have seen this interesting story ‘go a little deeper’.